As a child prodigy at the age of 2, Sowmya received her early Music lessons from her father Dr. M Srinivasan, and later came under the influence of Sangeetha Kalanidhi Dr .S Ramanathan and blossomed into a fine concert vocalist straight away. She also sharpened her skills under Smt. T . Muktha. Sowmya began singing while she was in school. Her maiden performance was at Sri Krishna Gana Sabha during the annual `Gokulakshtami festival’ when she was in the ninth standard. Talent and hard work have made Sowmya one of the leading Carnatic vocalists today. Music has now become a part and parcel of her life. Music should be viewed as whole and, hence, it is important to understand the science of it to bring out the art in it. This integrated approach has led this performing artiste to do a doctoral work on mridangam. Amidst this, she teaches music too. Even as she is engaged in assorted aspects of music, S. Sowmya wants to be known as a musician and not just a singer or a vocalist. Her research work has led her to show interest in literature. From Tamil work Tolkapiyum to Sanskrit work Ramayana and Rig Veda – Sowmya has dipped deep into `classical works’ to find out if wood and leather were seasoned in former times. " Environmental conditions and temperature affect the mridangam,’’ she said. The objective of her research was to find out a treatment by which mridangam could be modified without changing its basic structure to make it resistant to shruthi variation. Winning gold medals and prizes fom Music competitions at Schools and College levels became a regular habit for her and she followed this up by bagging several awards from Music Academy, Tamil Isai Sangam, All India Radio, etc. The Central Sangeetha Natak Academy and the Tamil Nadu Iyal Isai Nataka Mandram sponsored her concerts at various centres. Her melodious music has enthralled audiences all over the world including USA, Canada, New Zealand, Australia, Hong Kong,Malaysia, Singapore and Muscat. She has renderd more than 1000 concerts in India and released several audio cassettes, CDs which are popular. She is a regular performer of AIR (All India Radio) and Doordarshan. II Rank Holder and Gold Medallist in B.Sc. (Chemistry), Meenakshi College, Madras University, 1990. M.Sc. (Chemistry), Indian Institute of Technology, Madras, 1992. I.I.T. Blue, for excellence in Academics and cultural activities, 1992. I Rank Holder, B. A. (Indian Music), University of Madras, 1996. I Rank Holder and Gold Medallist in M. A. (Indian Music), University of Madras, 1998. Paper on "Microwave Enhanced Reactions in Carbohydrate Chemistry" in Synthetic Communications. Royal Institute of Chemistry award for Chemistry quiz conducted at the school and college levels. Distinguished Alumnus, Indian Institute of Technology Madras, Chennai, 2011. Sangeetha Choodamani, Sri Krishna Gana Sabha, Chennai, 2010. Sangeetha Siromani, Nungambakkam Cultural Academy, Chennai, 2009. Sangeetha Saptha Sagara, Shanthi Arts Foundation, Chennai, 2005. Vani Kala Sudhakara, Sri Thyaga Brahma Gana Sabha, Chennai, 2004. Bala Ratna, Shri Bala Tripurasundari Peetham, Nemili, 2005. Asthana Vidushi, Sri Sri Sringeri Sharada Peetham, 2003. Nada Bhushanam, Shanmukhananda Fine Arts, New Delhi, 2002. Tamil Isai Chelvi, Australian Tamil Foundation, 2001. Rasika Kala Ratna, Rasikapriya, Sydney, Australia, 2001. 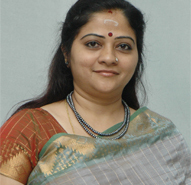 Sangeetha Kala Bharathy, Needamangalam VVS Foundation, Chennai, 2001. Nada Oli, Nada Inbam, Chennai, 2001. Isai Peroli, Karthik Fine Arts, Chennai, 1996. Yuva Kala Bharathi, Bharat Kalachar, Chennai, 1990. Sahithyapriya, Jan Kalyan (Kanchi Kamakoti Peetham), Kanchipuram. MLV Award, Outstanding young vocalist, 1986. T.V. Subba Rao Award, 1989. D.K. Pattammal & T.V. Subba Rao Award, 1990. Pappu Kamakshiamma Award (Best sub-senior vocalist), 1993. G. Ramakrishna Iyer Award (Sub- senior Vocalist), 1994. T. R. Rajagopala Iyer Award (Best Raga Alapana), 1995. Ariyakudi Trust Award (Best Lady Vocalist), 1996. Srirangam Gopalaratnam Award (Best Lady Vocalist), 1997. Outstanding Lady Vocalist - Senior, 2000,2001. AIR Music competition prize, Classical Vocal and Light Classical, 1987. Rajaji Tambura Prize, Tamil Isai Sangam, Chennai, 1983. Annamalai Vallal Prize, Tamil Isai Sangam, Chennai, 1980. First prize, Talent Promotion Concert, Krishna Gana Sabha, Chennai,1984. 6-year Cultural Talent Scholarship for Instrumental Music (Veena), Dept. of Culture, Govt. of India, New Delhi (at the age of 10). Sponsored by Central Sangeet Natak Academy, New Delhi for "Yuva Prathibha Mela", Thiruvananthapuram, 1987.